Football fans are in revolt. In recent months we have witnessed marches, petitions and campaigns on social media. The game we love is no longer affordable for many of us. Ian Ayre recently gave a speech on ‘how to run a football club effectively’. Everton fans will find out what that means at this seasons derby, paying more than fifty quid to sit in the Anfield Road end. When I was a kid, It never occurred to me that football had anything to do with politics. I spent my adolescent years in Liverpool, a city perpetually under attack from national government, so I was political. I joined the Labour Party, supported Militant and campaigned against the Poll Tax. Football, though, was a place to escape from all that. It was a place where dreams came true, and, at least in this arena, my city often triumphed. Footy was my favourite waste of time. A string of stadium disasters, and a botched attempt to introduce ID cards for football supporters, put paid to all of that. Even in my last refuge from the real world, I had become the ‘enemy within’. Class politics was evident everywhere. Football fans always with indifference for much of my life, now we were viewed with contempt. The post Taylor stadiums brought safer conditions, and multi-billion pound TV deals have seen cash flooding into the game. When I was a kid you never knew who your media moguls and captains of industry supported. Now we know Piers Morgan and Alan Sugar are a pair of cringe-worthy Arsenal and Spurs supporters. Football is the new rock and roll. It’s fashionable to be a fan, you only have to look at the VIP section of the directors box, in the main stand, to know that. Surely, with the rich and famous on board, we can all sit back and enjoy a golden era of supporting our clubs, right? Well not quite. Liverpool supporters know, more than most, that along with the millionaire sunshine, there’s going to be a bit of rain sometime. Hicks and Gillette dragged our club to the brink of extinction in their quest for profit. 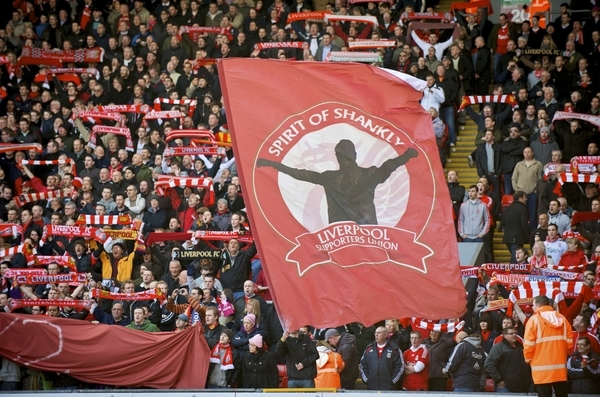 They left a bitter legacy, but they also spawned another political movement, Spirit of Shankly (formerly Sons of Shankly). Some would have you believe this organisation is a clique of hard-line Scouse supporters, who hate ‘out of towners’, and love causing trouble. For the former Fernando Torres of finance, Christian Cecil Purslow, they were a remnant of the old Militant tradition. He famously branded them the ‘Sons of Strikers.’ Could there be a more class laden statement than that? The reality is that Spirit of Shankly was and, albeit to a lesser degree, still is, a mass movement. Liverpool have established a supporters committee. They would prefer to channel all communication with supporters through this group. For its part the committee is made up of supporters who care passionately about their club. But, should they be the only conduit to the hierarchy? I’d argue there are many voices within the clubs fan-base, SOS are one, and they should be heard alongside the committee. The committee may well have challenged the club on many issues, such as pricing, but the outcome of this is lamentable. The current pricing policy at Anfield is light years away from affordable for many of us.That’s why Spirit of Shankly continue to speak for me. In the shadow of Shankly, but would the great man recognise the club today? Ian Ayre, argues that the club are doing all they can to make football affordable for fans. The club, according to him, is a business. Their budget, he says, is set for the next twelve months. There is no more cash in the till for fans. The measly sum of two hundred thousand pounds, set aside to help make away support affordable, will have to do. O.K. Ian, well what about next year? Why not budget for more, next season. Ayre’s response to the current ‘affordable football’ campaign is nothing but a brush off and, for me, it stinks. The Liverpool I grew up supporting was special. there was an iconic bond between club and supporter. At times it bordered on the mystical. Together we were greater than the sum of our parts. Sadly, for us, our club now seems to be disappearing over the horizon,and there are attempts to marginalise the ‘troublesome priests’. This is a huge mistake. When you are irritated by your critics, Ian, it usually means they are right. It is time for Ian Ayre to recognise that there are other voices out there. They are angry and loud, but that’s only because they care. There are buisnesses out there who would kill to have ‘customers’ as passionate about their ‘product’ as that. They would harness them, listen to them, and do all their power to ensure that they continued to be ‘repeat customers’. That the club don’t do this, in the case of SOS and their constituency, leads me to assume that their support is taken for granted. After all, for most supporters, you can’t switch your club allegiance, in the same way you can with a power provider. Liverpool Football Club is, in my opinion, making a huge mistake. They are missing a golden opportunity to do something unique, to be the first in England to put supporters at the core of it’s business. In doing so they would enhance their reputation globally. Imagine if going to Anfield was within reach for the majority. What if students, the unemployed and the low paid could afford a ticket? Just close your eyes and dream about a day, when I could afford to take all four of my kids to the game. What a world that would be. The depressing thing is that it is all possible. There are vast riches in the game, there is no need to milk the supporters. yet our club continues to bleed us dry. Bill Shankly never advocated the overthrow of capitalism. However, he did talk of a socialism, that was all about everybody sharing in the spoils of success. As far as I can see, his vision didn’t involve emptying our pockets in the process. Half a century on we are still told the club is a ‘family’, yet many of us are being priced out of it. Surely it is time for them to reconnect with the old ethos, that saw this club rise to to the pinnacle of European football. Surely it is time to embrace the Spirit of Shankly.